Volunteers of America Southeast Louisiana has been granted a three-year accreditation by the Commission on Accreditation of Rehabilitation Facilities (CARF), an international nonprofit accreditor for health and human services. This is the FIFTH consecutive three-year award Volunteers of America Southeast Louisiana has received. During the three day survey, the three person team of surveyors reviewed 950 standards to evaluate the organization’s conformance in eleven separate programs. We were in complete compliance with 97% of these standards. The surveyors reviewed agency documentation, consumer records, interviewed stakeholders; such as persons served, families, staff, funders, partnering agencies and board members. WHAT DOES ACCREDITATION PROCESS MEAN? In January, 1998, the Board of Directors and staff made a commitment to pursue this accreditation as part of our mission to reach and uplift all persons, and measure our success in positive change in the lives of those we serve. A grant from the Volunteers of America Endowment Fund helped us with the process. The decision to seek accreditation also sprang from our desire to provide the best services that we possibly can to our consumers. 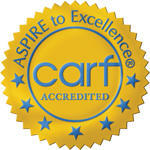 CARF accreditation is a “seal of approval” that tells others they can rely on us to do not only an effective job, but a superior job.